If you have a tank query and you can't find the answer anywhere else, post here. (TIP - Check for answers in FAQ, use the 'search' facility or even check this board before posting here). Hi all, I want to ask, if anyone already has fitted HL or Taigen gearbox to Tamyia tank. I am considering buying Jagdpanther DisplayModel, but I am not sure about what gearbox to buy (original Tamiya seems to be overpriced for my budget). Or I found a set that maybe include all internal parts for one gearbox, as body of gearbox is included (according to build videos in YT) within Display model of JP. I am just not sure, if there is all that will be needed to complete one gearbox. That set seems to have it all, except drive shaft bearings and all the little screws, it just has one screw. Be careful, those Tamiya repair kits aren't usually readily available - I waited 2 or 3 years for Axel's to get the Sherman set back in stock. As for fitting HL gearboxes, be warned that the drive shafts are different and the Tamiya sprockets likely won't fit right. You might end up having to go down the route of HL tracks and sprockets, or Taigen ones - HL and Taigen don't fit together, so you can't mix and match them either. I've never tried using Tamiya tracks with either HL or Taigen sprockets, so somebody else will have to comment on that. Isn't that for a Sherman though, I believe Mr Smaily needs the gear sets for a jag panther, and was just using that Sherman link at Axel's as an example. Oh I just copied the part number he showed and cross referenced it. 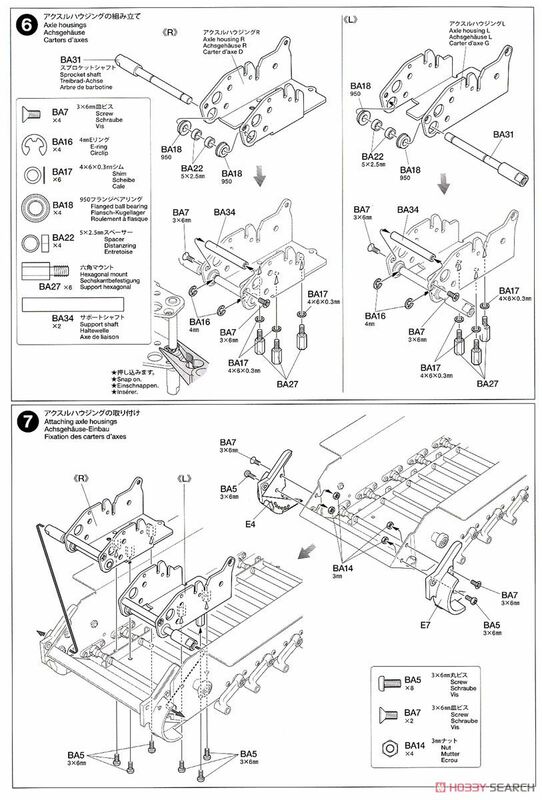 Same part number according to Axel's site? Yes and it maybe interchangeable with other kits. "Tamiya supplies a replacement set for the latest generation of gearboxes (the ones with the black plastic cover). It contains all gears, bearings, shafts etc.for one gearbox. The ordernumber is 9415807." 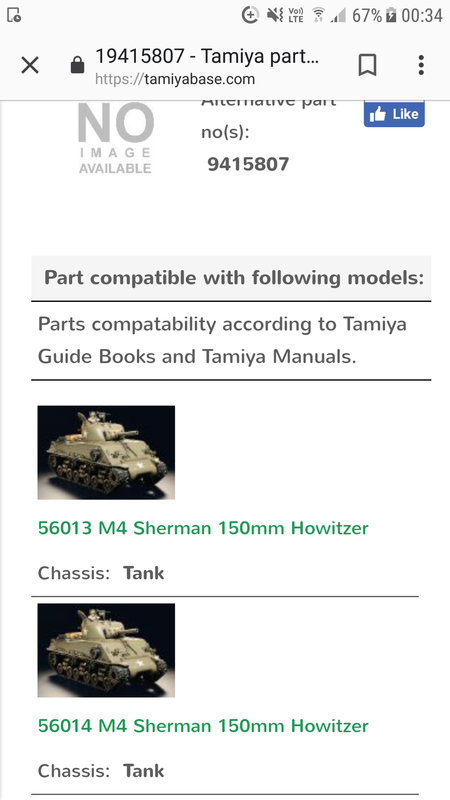 Oh, cool, I'm so used to heng long/taigen Sherman's having shorter gearbox shafts than jag Panthers, I forgot the tamiya Sherman's have long shafts the same as their Pershing etc..
That's weird Carl, I put your part number in the Tamiya parts data base and got this? Only two tanks it associates with that number? Edit, also found the drive shaft bearings that aren't in the gear kit for €10 a pair. And if the spacer bars are needed, that's another €5 per box, plus screws. Talking a minimum of €35 per box, plus shipping, and that's all depending whether the metal gearbox casing is in the tank. Thanks for very quick help guys. As long as this set will complete gearbox (or couple of more small parts), than it will make sense to order kit and also those parts for gearbox. I will just need some guidance as I have no experience with Tamiya tanks (but definitely like to build one). Also I would like to know, about shipping costs to Slovakia. This would be a good opportunity for Carson from DKLM to make a plate for his propulsion dynamics gearbox to fit in a Tamiya. I've thought about doing the same thing as you Smaily as I'm not a fan of the Tamiya electronics but I do like their kits. The gearboxes was a sticking point for me too so I'm very interested to hear how you go. Exactly B_Man. I am not interested on Tamiya electronics at all, so it is not worth of buying any full option kit. I would like to have all canon movement done using servos and most probably I will use OP TCB as a brain of tank (not decided about sound unit, but that has time). Now big question for those with experience, if set mentioned earlier will complete one gearbox, so two sets, full gearboxes. Or what additional parts will be needed. That is last thing that I need to know before I order kit and gearbox set. Smaily wrote: Exactly B_Man. I am not interested on Tamiya electronics at all, so it is not worth of buying any full option kit. Hi, I already answered you the same in facebook, lol. As I told you, it is not a bad idea to get the full option kit and sell the tamiya electronics. I am sure doing it will make you save money, and you will have the gearboxes, the black gearboxe grease guard (that I think you cannot buy alone, and is needed because prevents the gearboxes to dismount themselves!) and the speaker which has a very good quality. But thats my humble opinion. I bought the same Jagdpanther display kit last year, thinking that if prices were high then, in the future (post -the currently mythic Brexit) they'd be somewhere out in the Cosmos. The AAF museum is an excellent Tamiya parts resource for but, even if you can persuade them to ship at a budget rate (default rate can cost more than some significant parts ordered ), it can still be very pricey. All of that said, I've never bought from Tamiya-Carson direct, so their spares dept. is an unknown factor to me. Tamiya's default UK outlet is the Hobbyco. Again, I've never dealt with them, but I find their website slow and clunky. I don't know about you lot, but that can be off putting. As for the gear repair kit, as far as I'm able to tell, the innards (gears and shafts) are probably the same for most full-option models. I'd guess only the frame, output shafts, and standoff positions differ from one another. I have a brace of old Sherman gearboxes, and I'm going to try to transplant them into the gear frames supplied with the kit. There's no harm in trying, eh? Adam, (Ad Lav) is probably our Tamiya professor. I'm sure he'll know what possible options there are. Where are you, Adam?